A former St Teilo’s Church in Wales High School pupil, Robin Gwilliam, has landed a dream position with the Formula 1 team. Robin, now a mechanical engineering student at Cardiff University, competed against over 400 applicants across the UK and with only 5 places available he was offered the role he most wanted for his placement year. Working alongside top professionals in the field, Robin will be placed within the engine and powertrain division of the Design Office to help design components for the engine and transmission of the Williams Formula 1 cars. 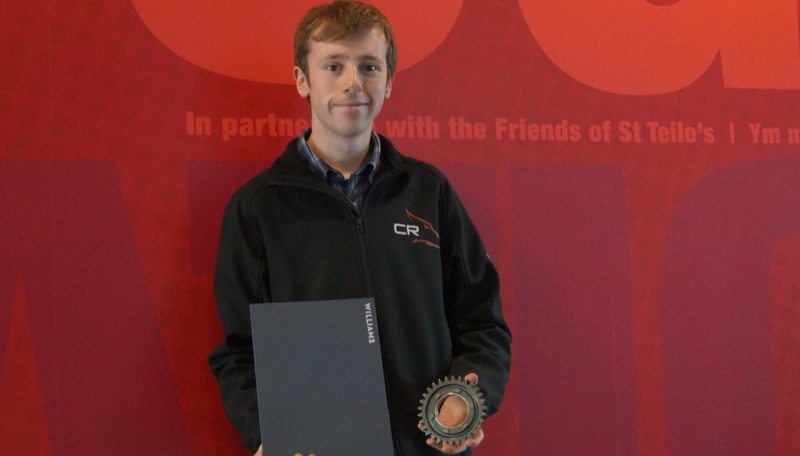 As part of the challenge, Robin assisted in building the car and competed at events in the Czech Republic and Silverstone where they secured victory as the first British team in the 20-year history of Formula Student. “The event at Silverstone was sponsored by Williams Formula 1 team so it was there I found out they were offering placements. I was able to use the experience I had gained through Formula Student to my advantage when applying,” he continued. Upon arriving at his interview, Robin was informed that he was one of only a few applicants who had made it to the final stages out of over 400 applications. When asked what he believes set him apart from the other 400 applicants, Robin couldn’t help but credit some of his success to his time as a sixth form student at St Teilo’s: “I think that aside from my engineering experience through Formula Student, my previous academic results gained at St Teilo’s sixth form were certainly a contributing factor, as they were of a high enough standard to make me stand out from the other applicants.